I realized recently that I have never reviewed the Harry Potter series on this blog, although I have read each of the books several times. It's funny to me that the Harry Potter books are such a touchy subject among Christians, while they have been welcomed throughout the rest of the world. The very fact that Rowling's books are so popular with the world may be part of the reason why they are so unpopular with Christians. When I was a teacher, every year I would have a discussion with my eleventh graders about the Harry Potter series. We would spend two days discussing discernment and entertainment choices and whatever popular book or movie series was currently in vogue in the world and under scorn in the Christian community. Most of my students would leave my class excited, but scratching their heads, because I didn't give them a list of books that they should or should not read. I absolutely refused to tell them my opinion in the matter, because, quite frankly, my opinion didn't matter. We would discuss the concerns some people have with books in general and the Potter series in particular. We would discuss the reasons a Christian might want to read a book even if it had been denounced from a local pulpit. We would discuss the reasons a Christian might choose not to read a book even if it were popular among his/her friends. I would remind my students of the importance of obeying their parents' rules regarding popular media while they were still under their parents' authority, and the importance of being wise when they were finally on their own. Then I would send them off into the world, hoping they would use their brains and Bibles to make wise choices. 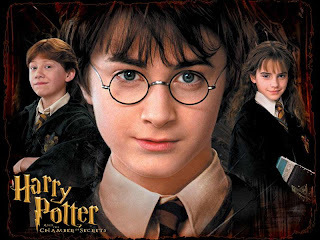 I never gave my students my opinion about Rowling's books, but I don't have students anymore, and I will admit that I really, really like the Harry Potter series. I like the emphasis on love triumphing over all, I like that the characters are brave and willing to sacrifice themselves to save their friends or humanity in general. I like the obviously Christian themes and imagery; not that Rowling is writing an allegory, but that she follows in a long tradition of literature written from a Christian perspective. I love the continuity of the books and the believeability of the characters. And like many of my former students, I am drawn to a story of an orphaned child with special powers. I can draw parallels between Potter's story and my own personal history, and I enjoy considering what house I would be in at Hogwarts and wondering if I would be brave enough to face Voldemort. I understand some people's concern about the darkness of the last few novels. I understand some people's concerns about the witchcraft aspect of the novels. I certainly don't think these books are appropriate for a young child, but I do think the novels could spur a lot of good discussion with older students, and for me, the merits of the books far outweigh any of the liabilities. But I have read the books, along with several other popular teen books, many of which I would not recommend. I absolutely refused to discuss a book with my students before I had read it for myself. Before I had read the Potter books, the only things I knew were those that I had heard in conversation or from a pulpit, and some of those things I heard were very scary. The scariest thing I heard was a preacher at a summer camp who quoted from The Onion as his source material for an anti-Potter sermon. I don't know that this man had ever read the books or that he spent much time in his research, but I do know that several hundred children left that service thinking that reading Harry Potter would necessarily result in their worshipping Satan. You are absolutely free to choose not to read the Harry Potter books or not to allow your child to read the books. Please, though, make an informed decision. If you are a parent, please read the first book before you form your opinion. Consider reading and discussing the books with your child should he or she express interest in them. And if you personally are choosing not to read the books, watch the movies, etc., that is absolutely fine, but don't judge those who do read the series, and please don't quote "facts" about the books or movies if you have not researched them. I promise to respect your decision not to read this series of books, and I hope you will also respect my decision to enjoy them (over and over again). Nicholson, William. The Wind Singer. New York: Hyperion, 2000. It's been a very long time since I found a book I genuinely wanted to keep reading to the point of ignoring my other responsibilities. It's been a very long time since I woke up thinking, "I had better get my stuff done quickly so I can get back to my book." 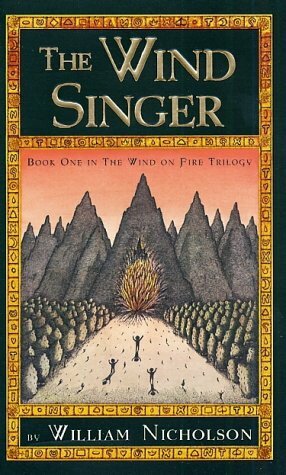 The Wind Singer is a book like that. 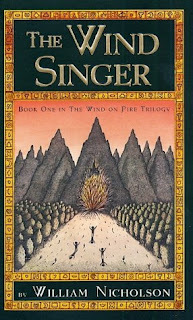 The Wind Singer is the first book in the "Wind on Fire" trilogy, but it would stand alone just fine. When Kestrel tires of constant examinations and the focus on ranking of families, she rebels against the system. Consequently, she and her family are punished and demoted from their status as Orange to lowly Grey. Furthermore, her father is sent for reschooling. Kestrel, her twin brother, and a classmate have heard the legend of the wind singer's voice, and they choose to leave their highly ordered society and journey to find the voice for the wind singer, a voice that is supposed to solve all the problems and hopefully will allow them to save their family. This book is similar to The Giver in that the society is highly controlled and a child chooses to break from that mold. This book is similar to the Lord of the Rings in that the children embark on a dangerous journey, battle the bad guys, and return victorious. This book is similar to the Chronicles of Narnia in that the three children learn some important lessons along the way. This is a great fantasy tale, free of objectionable elements and enjoyable. I'll have to see if my local library carries the next two books in the series. If I had a classroom, I would definitely put this book on my shelf. Bender, Jonathan. LEGO: A Love Story. Hoboken, NJ: John Wiley & Sons, 2010. If you are prone to obsessing over LEGO toys, do not read this book. If you struggle with the temptation to purchase more LEGO sets than any adult probably needs, do not read this book. I guarantee that reading this book will put shopping thoughts in your head, will lead you to the nearest LEGO store or website, and will result in LEGO sets piling up in your room. Fortunately for me, when I started reading this book I had just discovered some of the LEGO sets I had packed when I moved, and those sets satiated my craving to build, at least for a while. I'm not sure that I'm completely cured, though. LEGO is addicting. 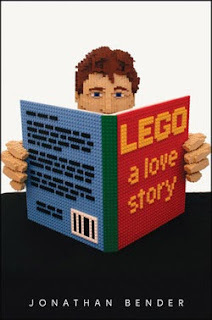 This book chronicles the journey of one man as he becomes an AFOL (adult fan of LEGO). He explores the history of LEGO and the world of AFOLs while he begins to build his LEGO creations. If you or someone you know is interested in LEGO bricks, this is a great book to read. It is interesting, it contains little-known facts about LEGO bricks, and it reignites the building addiction in those of us who played with LEGO as a child. A fun read and a true story, this book is worth your time. But you might want to grab a bag of LEGO bricks to tide you over as you read. Wood, Maryrose. 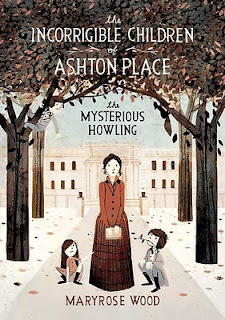 The Incorrigible Children of Ashton Place: The Mysterious Howling. New York: Harper Collins, 2010. Miss Penelope Lumley is sent from her school to the home of three children who desperately need a governess. When she arrives, she discovers that the three children are the very definition of wild: they have been raised by wolves. Now she has to attempt to civilize and educate them, and to do so before the Christmas party, which is rapidly approaching. But how can she attempt to teach table manners to children who can't sit still if they can see a squirrel out the window? I really enjoyed this story. The narrator's side comments are hilarious, the many "wise sayings" repeated by Penelope, and the antics of the children were entertaining and kept me turning pages long after I should have stopped reading to do something else. My only complaint is that I don't have the next book, so I cannot finish the adventures of these incorrigible children. If I still had a classroom, this book would definitely be on my shelf, and might be one that I would read aloud to my class. Pekkanen, Sarah. The Opposite of Me. New York: Washington Square Press, 2010. Lindsey and Alex are fraternal twins. Ever since they were children, Lindsey has always been the hardworking, smart twin, while Alex was the pretty twin who got all the attention. Lindsey has worked hard her entire life trying to impress those around her with her abilities in an attempt to get the spotlight Alex constantly steals from her. 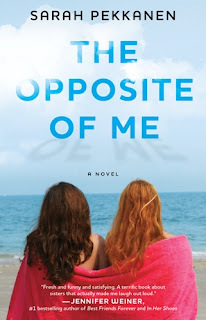 Lindsey's life falls apart around her and forces her to re-examine herself and her career choices, etc., while moving back in with her parents and helping her sister prepare for her wedding. Tragedy strikes, an family secret is revealed, and everyone lives differently ever after. This isn't my typical genre of literature to read, but I was intrigued by the concept of a family secret being revealed. Were the twins adopted? Maybe from different families? Was someone switched at birth? Were they really quintuplets, and they have never met their other three siblings? I imagined all sorts of exciting possibilities for this "family secret" as I began this book. Even though I chose to leave my job, unlike Lindsey, who was fired, I could relate to her struggle. Does she love her career because she enjoys what she does, or simply because she's never done anything else before? What should she do with herself now? I did not, however, much enjoy the rest of this story. The tragedy was unbelieveably predictible and the "family secret" was not nearly as exciting as expected. I was seriously disappointed. I cannot agree with the reviewer quoted on the front of the book who called it "fresh and funny and satisfying." It was not, unfortunately, any of those things. Check it out from the library if you enjoy this type of novel, my friends, but don't say I didn't warn you. Bassham, Gregory. Harry Potter and Philosophy: Hogwarts for Muggles. Hoboken, NJ: John Wiley and Sons, 2010. 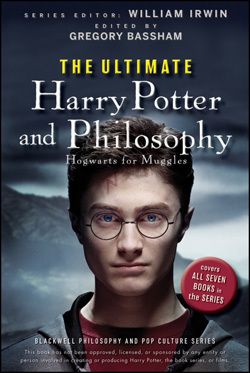 This book is a collection of articles which discuss the philisophical ideas presented in the seven Harry Potter books. Those of you interested in philosophy and familiar with the Potter novels will enjoy and appreciate this approach to the books. If, however, you are interested only in Harry Potter or only in philosophy, you may be a bit put-off by the complexity of the discussions in this book, and a basic knowledge of both subjects is necessary in order to follow some of the articles. Overall, I found this book interesting and thought-provoking, digestible only in small bits. I could finish reading one article per day during my lunch breaks at work and enjoy the deep thoughts before returning to whatever task awaited me, but this was not a book to read into the wee hours of the morning. I'm glad that I read it, but perhaps this is a better "check out from the library" book rather than a "put in one's own personal library" book, unless, of course, one happens to be a philosopher. Lucado, Max. Outlive Your Life: You Were Made to Make a Difference. Nashville: Thomas Nelson, 2010. In true inspiring Lucado style, this book is Do Hard Things for grown-ups. The author's basic point? There are a lot of hurting people out there, and God wants us to minister to them. By meeting people's basic needs, we can open a door to sharing the Gospel with them. Lucado doesn't guilt the reader with scores of statistics or make the reader feel as if she is wholly responsible for solving all the world's problems. On the contrary, Lucado makes the point that God has created each person with specific gifts, talents, abilities, and concerns for certain groups of people. Not everyone is comfortable helping the homeless, working with battered women, or caring for AIDS orphans in Africa. But someone is. And each person should do what he or she has been uniquely gifted to do. Each chapter contains several examples of people who are changing their worlds. There is also a discussion guide at the end, best used if this book becomes a small group study or a book club book. Overall, this book was a good read, inspiring me without making me feel guilty that I can't solve all the world's problems. I may not be able to do that, but I can donate a coat to foster kids or volunteer with my church to serve food at a shelter. Lucado's point - that we all can and all should make a difference by helping those around us - was well thought-out and explained without becoming overly preachy or self-righteous. This is a good book to purchase and pass around, or to add to the church library. Kingsbury, Karen. Unlocked. Grand Rapids, MI: Zondervan, 2010. I am not usually a big fan of mainstream Christian fiction. Generally, the characters are not realistic, the plots are practically identical to other books, and someone always gets saved by the end of the story. Generally speaking, I can read the back cover of such a novel and tell you the entire plot line, including the "riveting" ending. Unlocked shares many of these characteristics in that it is a predictible story with a Christian theme, but there are few things that made this book stand out and that kept me reading to the last chapter. First, I appreciated the bullying theme that is brought up throughout this book. Those of you who have been following my blog know that I have become a fan of the television show If You Really Knew Me. The characters in this novel could easily appear on that show. Each character falls into a stereotypical high school clique (jock, popular girl, emo boy, etc. ), but these groups are realistic representations of high school life, and a few of the characters choose to act differently from their stereotype. I appreciated the author's courage in broaching the topic of teen suicide, as this is a very real result of bullying, a result that has become quite common in recent years. Second, I enjoyed seeing parts of the story through the eyes of Holden, a character with autism spectrum disorder. The reader gets to see how others respond to Holden's disability, as well as how Holden views the world. Again, autism is a delicate subject, and I think the author treated it well in this novel, even if I could guess at the ending before I got there. Finally, this novel is part of the "Forever in Fiction" series, which helps to raise money for those in need by giving people the opportunity to donate in exchange for space in the book to memorialize a loved one or a group. The list of donors in the front of this book is amazing, and I had already read the story of Kate, the young lady who benefitted from the funds raised by this project. Kate is a young lady who is battling cancer; you can read her story here; she also appears as one of the characters in this novel. 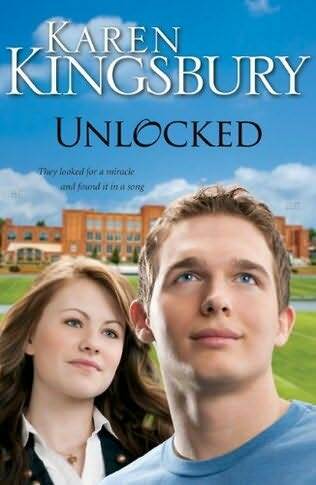 I will not be rushing to the library tomorrow to check out the rest of Kingsbury's novels; however, this book, similar to a movie on the Hallmark channel, was a nice way to spend a lazy afternoon. I enjoyed the story even if I guessed the ending after the first few pages.